You need to be built up. As adults, we often spend much of our time tending to others' needs - our children, our parents, etc. But sometimes in the busyness of helping others, we forget about ourselves. We want to come alongside you and help meet your needs. That's why we have a range of programs and activities for adults! We’re Building People! When we say, “We’re,” we are saying that life and faith are not to be journeyed alone. People gathering in smaller settings outside of the Sunday experience is a great next step in your faith. It is so exciting to hear the stories from people who are part of a Group. We hear about strong friendships, fun learning experiences, support in life’s hard seasons, parties in life’s great seasons. With the incredible variety of Groups available, we know your story is just waiting to be told. To learn about our Groups, or to try out what a Group is like, please contact the church office. “There’s a special bond that exists among the members of a small group." Encounter Live is an evening of extended worship that happens at our Newcastle Site on the last Sunday of each month at 6:30pm. Our band usually consists of musicians/vocalists from 4-5 different churches, so we encourage everyone, no matter where you consider your home church to be, to come out and worship with us. Our main goal for this event is to influence our church's worship culture, so we open our doors to other churches to come and worship with us. By inviting other worship leaders and team members, we can learn and grow from like-minded people. Our church also gets to see how other churches express their worship during the service. Although the music and settings are similar to Sunday morning, Encounter Live has a very different environment. Every event is also recorded live, and some of those recordings have been released for the church to have for free. 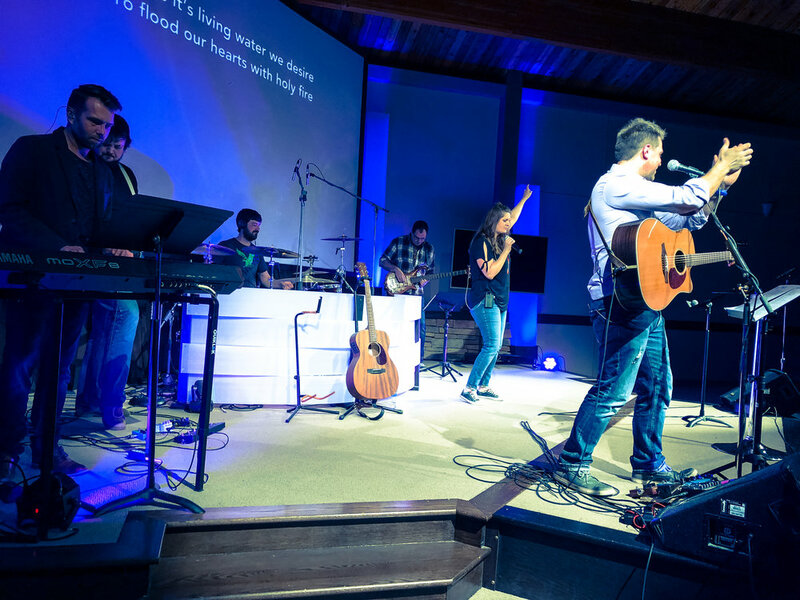 These recordings go back to our main goal - creating a culture for worship. We encourage the church to listen to these songs, and not just our recordings but worship music in general. Have it be a regular part of your daily listening while you drive, work, or where ever you can listen. In connection to Encounter, our Bathurst Site has launched Converge. This is also a night of worship that has a very similar vision to what we do in Miramichi and happens on the 3rd Saturday of each month. As believers, we were built for worship! You’ll enjoy the wide variety of songs, all designed to help lead you into the presence of God. Invite your friends! Rn'R takes place on the third Wednesday of each month at noon in the Fellowship Hall at the Newcastle Site - with the exception of the summer months. It is a chance for those 50+ to come together for a delicious home-cooked meal and to fellowship with others. Everyone is welcome! PrimeTime is a 50+ Coffee Club that meets twice a month at the Newcastle Site Lobby. It's a great time to visit and enjoy some coffee and sweets. Most weeks, a guest speaker joins the group to speak on an important topic. This event takes place the first and last Wednesday of each month at 11AM - with the exception of March and the summer months.